Thank you, Gerard and to the Institute for having me once again. Our health system is one of the best. The Australian health system is one of the very best in the world. Its success is founded on the principle of universality – that a government’s responsibility to its citizens, part of the social contract in this country, is that all people deserve access to the best possible health care. The dividend we all benefit from is a virtuous cycle where healthy, productive people keep the economy running, and a prosperous economy provides the funds required to continue investing in our world-class health care. Medicare, the Pharmaceutical Benefits Scheme, and our public hospitals, acknowledge the truth that keeping everyone healthy, and providing care to everyone who needs it, is not just of benefit to the individual but to the community at large. It is true that Australian spending on health has risen since the introduction of Medicare, both in dollar terms and as a fraction of our GDP. In the last 25 years, overall spending on health as a percentage of GDP has slowly grown – from 6.5 per cent in 1990, to 9.7 per cent today. It is projected to keep growing – by another 1 per cent of GDP in the coming decade. This increased spend in healthcare is often attributed to the ageing population but the most significant factor is increasing access to new healthcare technology – new drugs, diagnostics and treatments. That’s a good problem to have. We now have the option of providing people with access to lifesaving innovations that simply didn’t exist a few years ago. So, the real question is not whether health care spending is sustainable, but whether we choose to prioritise that spending over other things. People make the choice already in their daily lives. The wealthier we become, the more we spend on health. So, the real question is not whether health care spending is sustainable, but whether we choose to prioritise that spending over other things. The question of efficiency, or value for money is an entirely different question and one I’ll come to in a moment, but of course we should ensure that every dollar is used wisely and we eliminate waste wherever we can. Our health spending is not unusual by comparable global standards. Average spending on health in the OECD is about 9 per cent of GDP. The European average is greater than 11 per cent, and the United States spends 17.1 per cent of GDP on health – and in a system that is famous for delivering worse outcomes and greater inequality. The US experience and international data demonstrates the folly of pursuing a user pays system. Australia’s universal health care system, with Medicare as its centrepiece, is efficient because a single insurer has tremendous power to keep health care costs down. But Medicare did not just pop into being in the 1970s – it was a hard fought, ideological battle – with Liberal governments and their ruthless individualism, sceptical from the outset. It waxed and waned over several years, before taking hold as a fixture of health policy – due to the weight of public opinion in its favour. Medicare did not just pop into being in the 1970s – it was a hard fought, ideological battle – with Liberal governments and their ruthless individualism, sceptical from the outset. But let’s not be fooled into thinking that the Coalition government are any more convinced of the worth of Medicare than they were at the time it was introduced. These days the attack is on cost – claiming current spending is “unsustainable” and looking for ways to force people to pay more for their care. We have seen the Liberals slash funding for hospitals and attempt to introduce co-payments but be defeated by the senate. Not to be deterred, they’ve frozen MBS indexation, a proposal first introduced by Labor, which has forced doctors to put up their fees. These attacks have been resisted by the Australian public who strongly oppose any erosion of our public health system. But there is a more insidious and far less well known attack that is undermining the core principle of universality in our health system. Australians have long had the choice to supplement their access to care in the public system, by purchasing private health insurance. But this choice is no longer a genuine choice because depending on your income you are either subsidised or punished by the government for the choice that you make. To understand why we need to look at the history of the private health insurance industry. In 1997, after a number of years of declining private health insurance cover, John Howard introduced a range of reforms to private health insurance. His stated reason was to “take the pressure of the public system” but many would argue that the real agenda was to undermine the universality of Medicare and push Australia closer to the deeply flawed user pays model that exists in the US. The reforms included the Medicare Levy surcharge, the private health insurance rebate and Lifetime health cover. 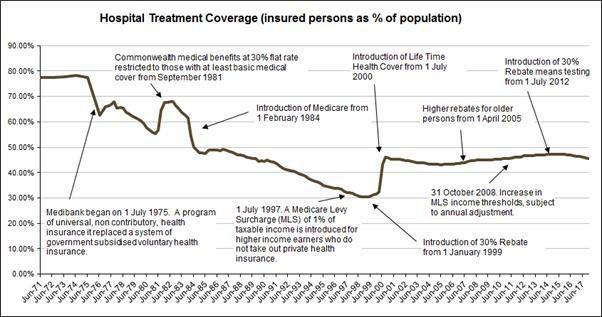 [As you can see on this graph] the introduction of the Medicare Levy Surcharge in 1997 and the 30 per cent rebate in Jan 1999 caused an almost negligible uptick in PHI coverage. What did work, and what represents the significant increase in cover [as shown in the graph] was the introduction six months later of the Life Time Health Cover. What the data shows is that even if you agree that we should pursue a public policy goal of increasing the uptake of private health insurance, and the Greens don’t, the private health insurance rebate has been a huge waste of public money. The Private Health Insurance rebate will cost the taxpayer $6.4 billion this year, and that creeps up to just under $7 billion by the end of the current forward estimates in 2020-2021. In total it is predicted by the department to cost us $26.3 billion over the next four years. Far from taking pressure off the public system, the rebate in fact redirects a huge sum of money away from the public system and straight to the bottom line of private health insurance companies. To put no finer point on it, the private health insurance rebate is the biggest con in the health system. It’s regressive because it means that poorer, working families who don’t have private health insurance, subsidise the healthcare of their wealthy neighbours. It is no wonder, that when the Howard government introduced it, Labor’s health spokesperson at the time, Jenny Macklin called it “the worst example of public policy ever seen in this parliament”. That hasn’t stopped Labor now supporting it. So what do we get for $7 billion and rising every year? It has comprehensively failed in its principle policy objective of taking pressure off our public hospitals. Waiting lists continue to be a huge problem and people with PHI continue to use public hospitals to avoid paying out of pocket costs associated with private care. Further the industry has treated its customers appallingly, and year on year we see premiums rising along with profits, while exclusions on policies grow also. The government must approve all rises by law, but this is usually a formality with successive Ministers standing by and letting them have whatever exorbitant increase they request – the average rise might be 3.95 per cent this year, but the highest was far higher at 8.9 per cent. That is a huge hole in the family budget. Of course, the taxpayer underwrites nearly one third the cost of increases through the rebate, which means we are giving a blank cheque to insurers. This is the same industry that had a jump in profits of 7.3 per cent over the course of 2017. This is taking the idea of junk policies to a whole new level. When I asked whether the government is concerned about this at estimates last week, their response was that Bupa are in fact late to the party on cutting back their policies to this extent, and many other providers already have policies which provide such meagre cover. The reason for these junk policies is simple. It has nothing to do with health care and everything to do with tax minimisation. It’s a rational decision to avoid paying the Medicare Levy Surcharge. This is where the rort on the public system becomes farcical. Not only are we providing billions of dollars every year in taxpayers money to private health insurance companies, but wealthy people are able to avoid paying a proportion of their income tax if they have even the most basic form of private health cover. This means that they pay less to support Medicare, but the cover they receive under their policy is so insignificant that they will seek treatment through the public system anyway. Well, we need a more rational approach to funding healthcare in Australia. A huge issue which undermines focus on patient outcomes is the cost shifting between the federal government and the states and territories. A huge issue which undermines focus on patient outcomes is the cost shifting between the federal government and the states and territories. The same constitution that has seen several MPs and Senators (including two Greens) expelled from the Parliament for being dual citizens, established the situation in which the federal government is responsible for primary care while the states take care of hospitals. This has led to constant cost-shifting between the two layers of government, with each side trying to push the costs of care to each others’ balance sheet. That’s why the Greens would implement a single funding model to take these decisions out of the hands of either government. We support the model proposed by the Australian Health and Hospitals Association for an Independent National Health Authority, which sits at the centre of their Blueprint for a post-2020 National Health Agreement. We didn’t think it could be done in monetary policy, but now it’s inconceivable to imagine the absence of the Reserve Bank. The same would be true with an independent authority for health. Of course, the Australian Greens would reinvest the private health insurance rebate, into service delivery in the public system. That is where the need is, and that is where the best value is. Let those who want to pay for private healthcare do so, but let it be a genuine choice without a hand out from the taxpayer or tax penalty from government. The Australian Greens would reinvest the private health insurance rebate, into service delivery in the public system. The first item of business in reinvesting the rebate would be the immediate unfreezing of the Medicare Benefits Schedule. That includes on radiology, which has now been in place for 20 years. The current average out of pocket “gap” payment for radiology services is approximately $100, up to $150 for complex services like MRI or CT scans. These figures are out of reach for many Australian families, with 300 000 Australian patients in 2017 not diagnosed due to the high cost. The Greens are the only party who have opposed the freeze from the very start – the Labor Party would like us all to forget that they were the party that imposed the full MBS indexation freeze before the 2013 federal election. The government has agreed to lift the freeze, but they are doing so at a glacial pace – we can and should move on this immediately. The Greens are the only party who have opposed the freeze from the very start – the Labor Party would like us all to forget that they were the party that imposed the full MBS indexation freeze before the 2013 federal election. As I said at the outset we should also look to ensure we are getting the best value for money. I am a strong supporter of ensuring efficiencies in health, and I advocated very strongly for the review of the MBS. We spend a lot of money on investigations and treatments that provide little benefit to patients, and in some cases actively cause harm. We need the courage to take on vested interests and eliminate low value care and get the most for every dollar we spend. The Greens would also reform our primary care system to better manage the care of the millions of Australians suffering from chronic illnesses. We know that the current system which sees doctors paid for throughput rather than for longer term management of care doesn’t work for chronic conditions. We also know that there are a range of allied health services – podiatrists, dieticians, physios – that patients currently do not have access to via Medicare. Real reform in this area – not the flawed Health Care Homes trial that the government is currently pursuing, which looks more like rationing care – is another key area for investment. Rather than just focus on how we manage chronic illness we would work to reduce the incidence in the first place. This government has savagely cut investment in preventive health and overseen a drastic increase in rates of obesity and associated chronic diseases. Rather than just focus on how we manage chronic illness we would work to reduce the incidence in the first place. It’s completely irrational – surely the easiest way to drive down the health budget is to help people stay healthy in the first place? Why should the mouth and teeth be treated any differently from the rest of the body? Poor oral health can have significant implications like leading to low birth weight and premature babies, increased risk of heart disease and life-threatening infections. Not to mention social isolation, poor diet, and depression, and financial consequences. Many people avoid visiting the dentist and older people, those on lower incomes and people in rural areas are most likely to pass up a visit to the dentist due to cost. The Greens’ balance of power agreement in the Gillard Government saw the establishment of the Child Dental Benefits Schedule – the first Medicare funded dental care scheme in the country. The Greens want to see Universal Medicare funded dental care, and we will begin this process by expanding to aged pension recipients and full benefit income support recipients, and then to commonwealth Seniors Card Holders and all other Concession Card holders. These are the people that are most likely to forgo treatment. To that end, I’ve written to the opposition leader who recently supported our call for Medicare funded dental care, to indicate a willingness to work together on a proposal that would redirect the private health insurance rebate dollars into Denticare. Finally, we should expand access to public dental care and end its inexplicable exclusion from Medicare. This is my plan, the Australian Green’s plan, for the Australian health system. Labor talk about being the “party of Medicare”, but they can no longer be trusted to protect it. If you’re serious about protecting universal health care, you can’t continue to support subsidising the private health insurance industry. Labor talk about being the “party of Medicare”, but they can no longer be trusted to protect it. Defending universal health care now rests with the Greens.